Is drinking a Coca-Cola equivalent to drinking Apple Juice? So I was out to lunch with a friend when he expressed to me that drinking a coke was no different than drinking an apple juice. That side-by-side the sugar content is similar (sugar, is sugar, is sugar) and therefore the potential negative impacts were equivalent. (*Note: My friend stated “no matter how fresh squeezed, cloudy or full of nutrients it was”). 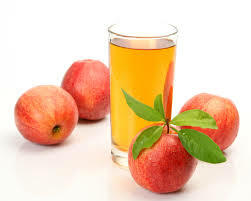 Categories: Food and Health, Food in the News | Tags: apple juice, Coca-Cola, fruit juice, is juice bad for us, is juice good for us, is juice healthy, orange juice, sugar in juice | Permalink. I find that I love this article about the Twins and the Sugar vs Diet experiment. However for me, what they miss is that a) sugar/fat are fuels that need to be cleaned up (and therefore eaten with nutritional powerhouses and clean-up antioxidant power spices, sauces, condiments etc), when sugar and fat are put together they are like super fuel and b) that process foods imitate healthy combinations of real foods (not choice between health food or “tasty” junk food), because the flavors imitate synergistic qualities of foods that would originally “buffer” the impact of the sugar and fat (ie acids “balance” fat, baking spices “buffer” sugar, tang from fermented foods all attenuate food-induced obesity or metabolic disturbance). Junk food is like an over-extreme source of energy, or jet fuel, a more intense version of energy, but because it’s all “flavoring” and not real foods, processed food is so incredibly damaging. Do you or do you not love chicken wings? Are you scared of them because you may think they are horribly bad for us or do you throw caution to the wind because they are just so wonderfully delicious with messy addictive sauces?!? Categories: Food and Health | Tags: Are chicken wings healthy, Chicken wings, Fermented Red Chili Paste, Genistein, Gochujang, Kochujang, Meju | Permalink. Yoni Freedhoff and the Flawed Calorie Perspective: Would a Stress Perspective be better? Yoni Freedhoff, MD, founder and medical director of Ottawa’s Bariatric Medical Institute has written an article entitled “Counting Calories Is Flawed but Here’s Why I Still Do It”. His article takes the complex math of unique burn rates of foods and people and assumes these differences are irrelevant to calorie counting validity. And hence why counting calories continues to be Yoni’s go-to obesity management tool. Yoni says because it’s simple, it’s scientific and there’s nothing better yet, even if it’s technically not correct that a calorie is a calorie or that the human system complicates the math. Yoni feels he can still keep it simple by counting calories, just whole foods are less, some people can eat all they want and some can’t. Some of us are walking around driving Humvees while others drive hybrids. The Humvee drivers are the folks who get virtually no fuel economy for their energy stores and consumption. Humvee drivers are like that study subject who barely gained weight despite eight weeks of over feeding, eating whatever they want without having to worry about their waists. The hybrid drivers are the folks who can look at an indulgence and gain weight. Categories: Food in the News | Tags: counting calories, obesity management, Thermic effect of food, yoni freedhoff | Permalink. Food Stamp Challenge #1: Replace $1.59 Wendy’s Bacon cheeseburger. You could probably make a straight up better cheeseburger, but I’m looking for instant satisfaction, quick and portable. I’ll be packing or eating at home, so I wanted a similar convenience. I thought a quick charcuterie-type food would be my perfect quick ‘snack food”. Traditional. Healthy. Satisfyingly deep, rich, bright and light. Categories: Food and Health | Tags: Food Costs, Food Stamp Challenge | Permalink. Brown Fat Vs White Fat? Categories: Food and Health, Food in the News | Permalink. Chicken Wings the deep-fried healthy way? I had a challenge on Twitter yesterday about whether I’d be eating (and I think buying a round of) chicken wings in the name of health. Ok, I’ll take that challenge. Can chicken wings be healthy? Or at least let’s say less unhealthy? 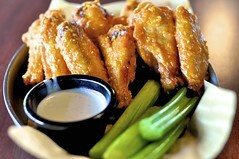 Categories: ALL | Tags: Chicken wing sauce, Deep frying, Healthy Chicken Wing recipe | Permalink. Skipping breakfast leading to heart attacks? Well yes, if it causes stress. The interpretation is sort of our classic oversimplification and very linear (which is a single thing creates a single outcome) view of the evidence. “Skipping Meals Leads to Heart Attacks”. Categories: Food in the News | Tags: heart attack risk | Permalink.